We’re closing out our 40th anniversary album with photos from 2018! Included are photos from our annual college-wide retreat on Oct. 26, our Monster Splash Halloween contest and 40th anniversary party on Nov. 29. Please feel free to download, tag and share. Thanks for the memories, Rio Waves! We look forward to creating more memories with you in 2019! 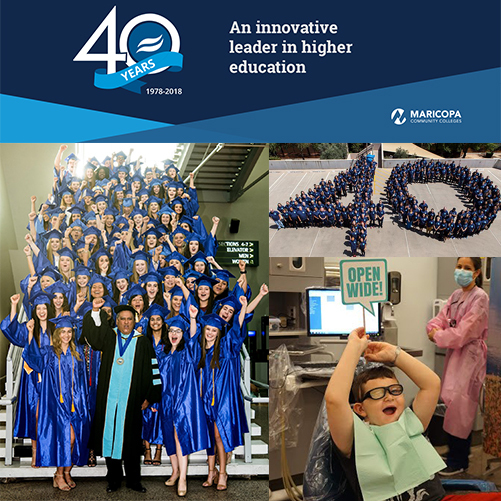 Here’s to Celebrating 40 Years as an Innovative Leader in Higher Education. Learn more about our 40th anniversary celebration. We're wrapping up 2018 and our 40th anniversary celebration with this retrospective video, which chronicles our college’s history. 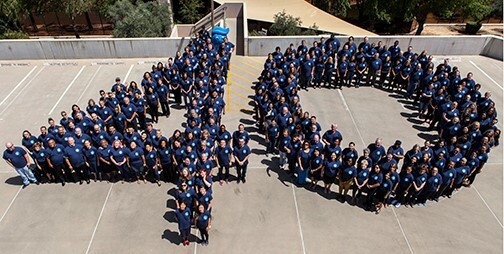 Since 1978, Rio Salado College has had the privilege of serving more than 665,000 students and has awarded nearly 100,500 degrees and certificates. We are honored to be a part of this legacy and to be of service to you. We look forward to helping you on your next educational journey in 2019 and the years to come. Happy Holidays! A friendly reminder, the Maricopa Community Colleges and most Rio Salado services will be closed Mon., Dec. 24, 2018 – Tue., Jan. 1, 2019 for the winter break. We will resume regular business hours Wed., Jan. 2. Communiversity at Queen Creek: Wed., Dec. 26 – Sat., Dec. 29, 8 a.m. - 5 p.m.
Northern: Wed., Dec. 26 – Sat., Dec. 29, 8 a.m. - 5 p.m.
Tempe Headquarters: Wed., Dec. 26 – Sat., Dec. 29, 8 a.m. - 5 p.m.
Tempe Headquarters: Thu., Dec. 27 – Sat., Dec. 29, 9 a.m. – 2 p.m.
Tempe Headquarters: Dec. 26-27, 9 a.m. – 5 p.m., Dec. 28 – 29, 9 a.m. – 2 p.m.
Our 24/7 services such as Technology Helpdesk, RioLearn, Ask a Librarian and My.Maricopa.edu will remain available. Here’s to Rio Salado students like Laura Manna, who are challenging themselves and exploring new opportunities! Manna, who is a Computer Technology program major, stepped out of her comfort zone to enter Maricopa Community Colleges’ 2017-18 Creative Writing contest, which would lead her to winning a second-place essay award-- and a new-found sense of confidence. Manna represents some of the top, local students we've come to rely upon to provide us with feedback and serve as college ambassadors. 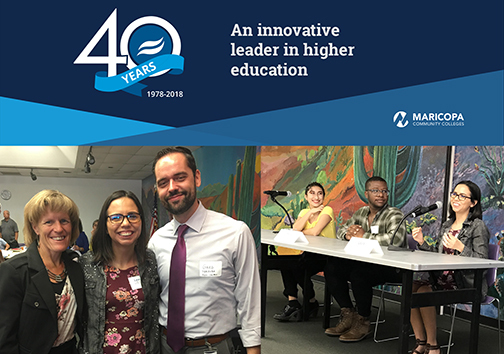 Pictured above is Manna taking a photo with our Interim President Kate Smith and new Vice President of Student Affairs Greg Pereira and participating in a student panel during our New Faculty Orientation held at South Mountain Community College on Aug 10. The student panel shared emotional and motivating stories about their engagement with their faculty and advisors who have helped them reach their educational goals. 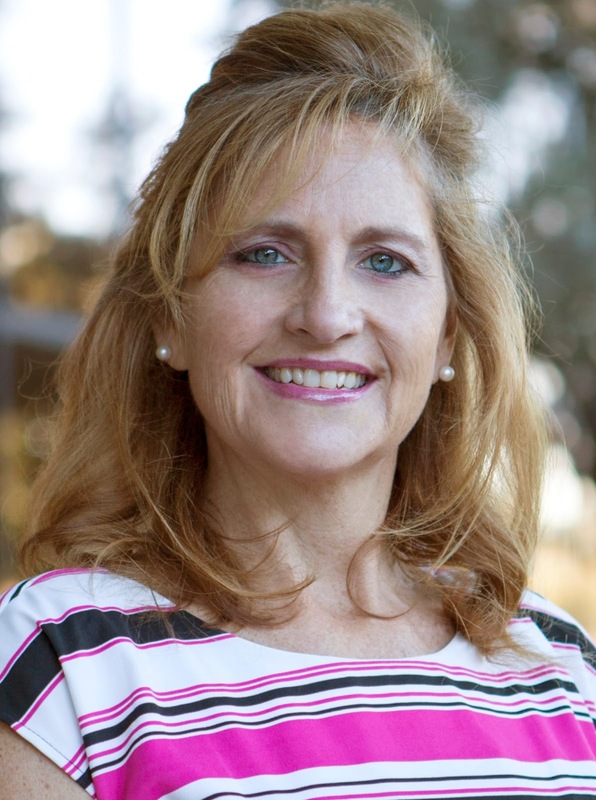 Thank you, Laura, for being a part of our Rio Salado family. We are proud of your efforts and accomplishments. 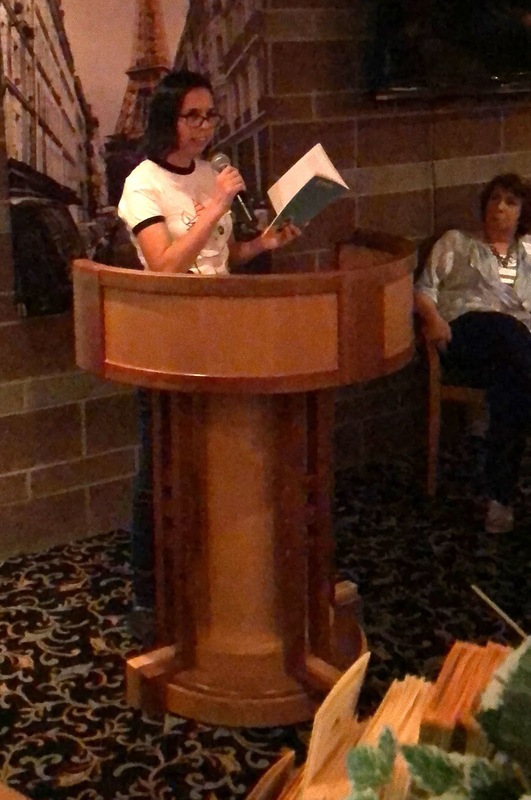 Learn about Manna’s journey into becoming a writer and read her award-winning essay, “Rain, Dirt and Sky” in this inspirational RioNews student spotlight. 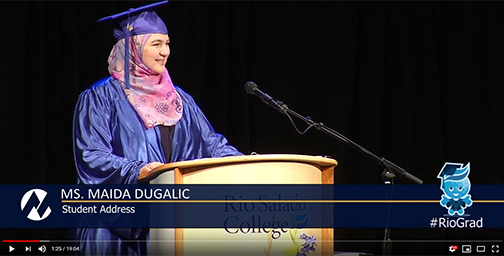 We continue our 40th anniversary tribute to students with one of the most inspirational speeches of the year-- presented by High School Equivalency (HSE) graduation student speaker Maida Dugalic at the May 2018 HSE graduation ceremony in Phoenix. Watch it now on YouTube. 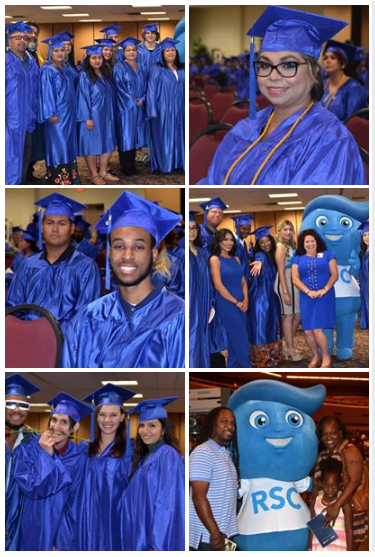 Maida represented more than 200 HSE grads, who completed Rio Salado’s GED® test prep classes and passed the GED® test in 2018. Learn more about Maida in this RioNews blog. 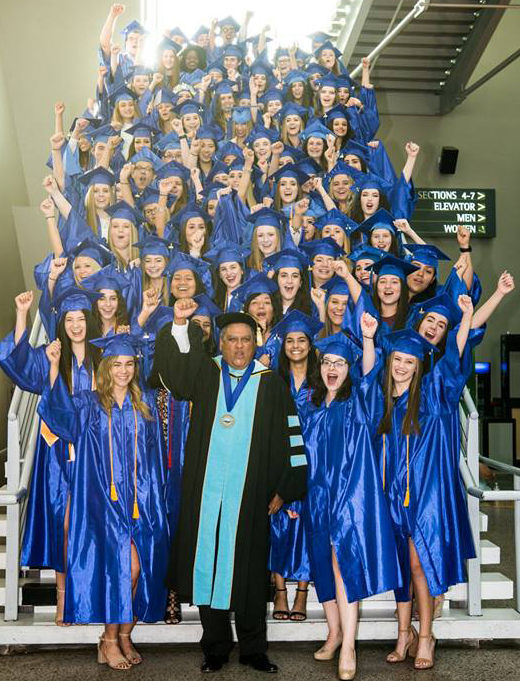 Here’s to all Rio Salado HSE grads! We hope you will continue your educational journey to higher learning. Learn more about Rio Salado’s GED® test prep program by calling 480-517-8110 or visitingwww.riosalado.edu/programs/abe. 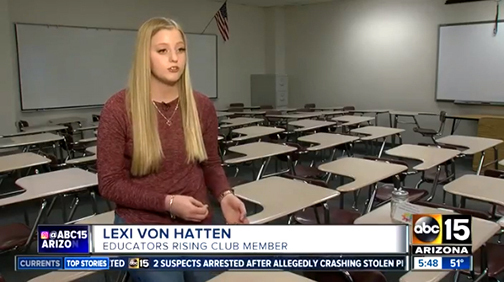 Gandhi once said, “The best way to find yourself is to lose yourself in the service of others.” Rio Salado dual enrollment student Lexi Von Hatten, a senior at Mountain Ridge High School in Glendale is experiencing that first hand. This ABC 15 story by reporter Nohelani Graf sheds light on the volunteer work Von Hatten is doing to help special needs students—and the discoveries she’s made along the way. Von Hatten, who hopes to be a teacher one day, is also a member of Educators Rising Arizona, which helps mentor young people on a path to becoming teachers— and challenged her and fellow members to find a community project that would make an impact. 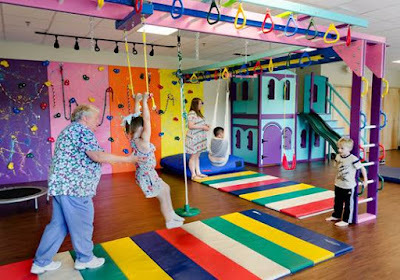 As her project, Von Hatten chose to help Mountain Ridge create a more dynamic “sensory room,” a place where kids living with disabilities can find a calm place to focus and learn when things get a little too stressful in the classroom. "My greater hope is this will cause a ripple effect," said Von Hatten. 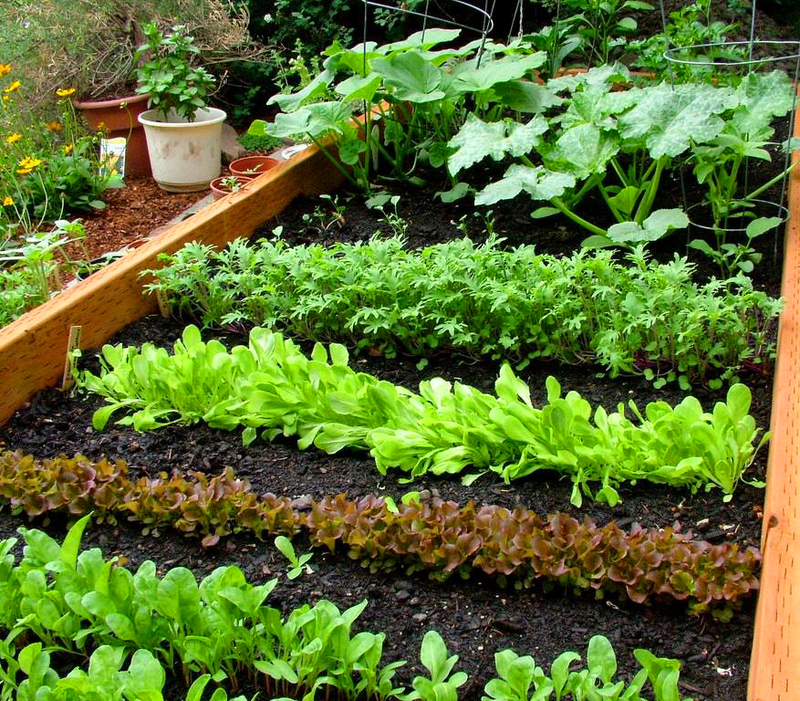 Become the "You," the world needs now with Rio Salado's Sustainable Food Systems program! Our program is designed for people who have a passion for food, fair trade and sustainable practices that protect our environment. You can earn a certificate or degree-- and gain real experience with industry experts. With our hybrid program, you’ll work hands-on with food, urban agriculture, small-scale farming and cooking— and work online at a time that's convenient with your lifestyle. Our Sustainable Food Systems program is designed for students who work in the food service industry as well as newcomers who do not have a culinary background. Watch this video to hear what graduates have to say about the convenience, flexibility and affordability of this program. Ready to get started now for spring? Enroll at www.riosalado.edu/food. Classes start most Mondays! Learn more about the sustainable foods movement in America—and our Café at Rio in this RioNews feature. Most of the Café @ Rio produce is raised locally or at our on-site garden. Rio Salado College is committed to its Sustainability Pledge. The college has incorporated sustainability as a core value and has developed several programs and practices that embrace the sociocultural, environmental and economic facets of sustainability. It’s not just a matter of teaching others how to be sustainable-- Rio Salado strives to be a leader in environmental responsibility by incorporating earth-friendly practices throughout its daily operations. Rio Salado student Caitlin McGough didn't plan to be a scientist-- but then serendipity opened its doors. “I needed another class to satisfy my financial aid, and the nanotech class seemed really interesting. I took it and fell in love with it,” she said when she signed up for online classes at Rio Salado College in Tempe, Ariz. 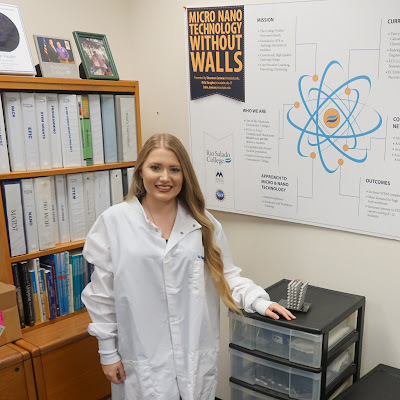 When scientists work with them, they have to use so-called clean rooms to guarantee the nanoparticles aren’t contaminated or even destroyed during experiments. “To put it in perspective, even a follicle of hair or a skin cell falling off across your sample would be kind of like the Eiffel Tower falling across the landscape of Paris,” Vaughn says. Scientists are using these tiny particles in, well, almost anything. Nanoparticles are used in the commercial production of everything from hydrophobic (water-repelling) clothing and digital storage, to the production of puncture resistant tires, cosmetics, and even a paint that will “heal itself” if scratched. Carbon nanofibers, for example, are used to make ultra light and strong bicycle frames. The carbon atoms arrange themselves hexagonally at the nanoscale. 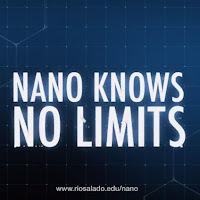 They’re rolled into nanotubes, which are crafted into a bicycle frame that weighs about two pounds and is geometrically lighter and stronger than steel or aluminum. 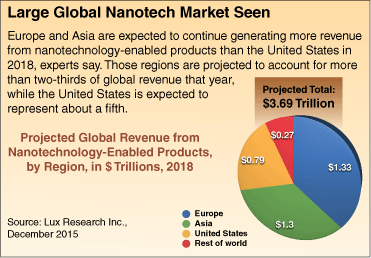 The explosion of commercial applications for nanotechnology has created a huge demand for jobs, with no real end in sight. “Technology innovation, development, and manufacturing is a very diverse area of expertise and a very diverse job market,” says Barbara C. Lopez, a research engineer at the University of New Mexico (UNM). It’s so dynamic, Lopez says, that it’s hard to put a number on just how many jobs will be created in the next five years. Revenue growth, though, is a different story. It’s pretty easy to put a finger on that, although it may be harder to get your mind around. One small segment of the industry known as BioMEMS “is estimated to double in revenue from $2.8 billion now to $6.1 billion in 2023,” Lopez says. Nanotech will provide “areas of tremendous growth and opportunity for today’s students,” she says. Matthias Pleil, also a researcher at UNM, says that the job growth rate in the MEMS field alone is between 10-15 percent per year, which he suspects is indicative of the nanotechnology industry as a whole. The jobs are not limited to high-end scientists, either. In fact, UNM’s Lopez says the people who can operate and fix the machines that are designed by Ph.D.s are the ones who are most in demand in the job market. But therein lies the problem, according to Lopez. The United States has a shortage of skilled technicians, she says. Pleil agrees that there is simply a sheer lack of people. For example, “A large company in New York hired 400 engineers and about 1,000 technicians a few years ago,” Pleil says. The company, Global Foundaries, had a hard time finding people. The pay is pretty good for someone with a certificate or associate degree. 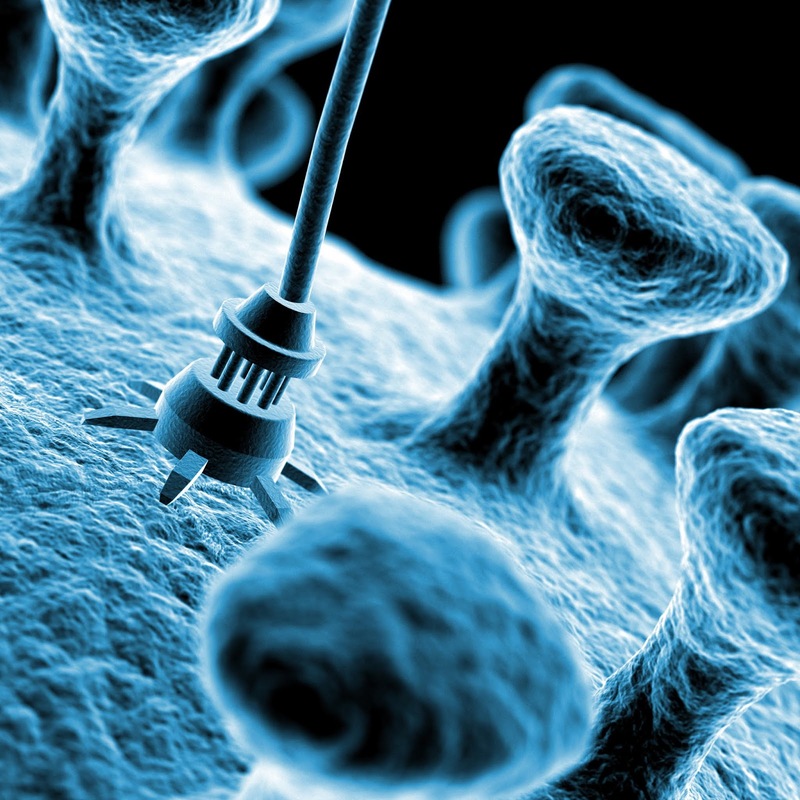 According to an online job search site, a technician in the nanotechnology field averages $57,000 a year in Arizona. 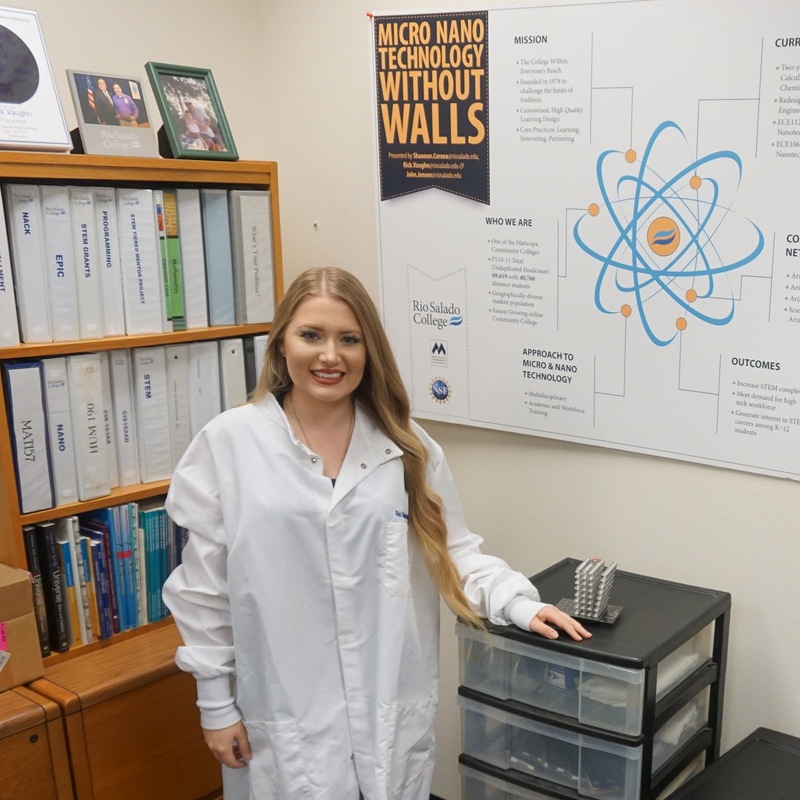 That degree also puts future technicians in a good place to pursue a bachelor’s degree in the nanotech field, which opens doors to higher paying jobs. McGough has just completed her coursework at Rio Salado College and is in the process of distributing her resume. More likely than not, her search won’t last too long. 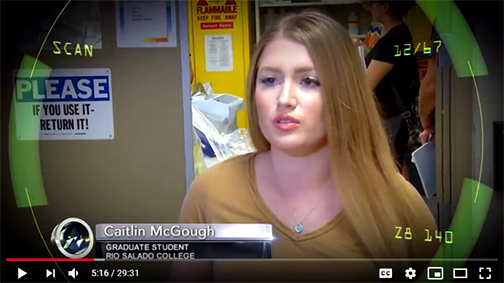 Watch this episode of MCTV’s MaricopaNow featuring Rio Salado’s Nanotechnology program. By Rio Salado College Sr. Project Manager and Brand Journalist Mark Moran. 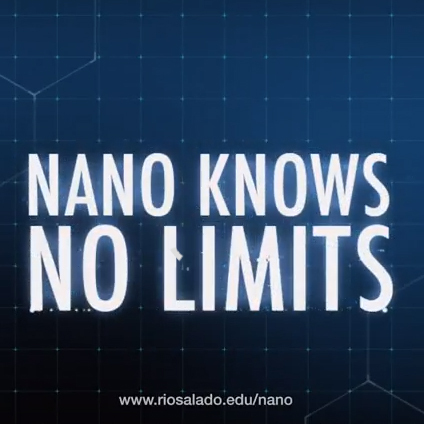 At Rio Salado College, Nano Knows No Limits. See where it takes you! Holiday Hours Begin Monday, Dec. 21! A friendly reminder, Rio Waves. Our holiday hours begin next week. Please plan accordingly. Advising, Admissions, Registration & Records, Cashier's Office, Disability Resources & Services, Financial Aid and Veterans Services: Dec. 17 – 21, 8 a.m. – 5 p.m. Bookstore: Dec. 17 – 21, 9 a.m. – 5 p.m.
Café at Rio: Dec. 21 Coffee Bar open 7-11 a.m., Café open 11 a.m. – 1 p.m.
Computer Lab Tempe Headquarters: Dec. 17-20, 9 a.m. -5 p.m., Dec. 21-22 9 a.m. -2 p.m.
Tutoring Tempe Headquarters: Dec. 17 – Dec. 21, 9 a.m. – 2 p.m. Dental Clinic: Dec. 17 – 20, 9 a.m. – 3 p.m.
Technology Helpdesk: Dec. 17 – 21, 7 a.m. – 5 p.m. 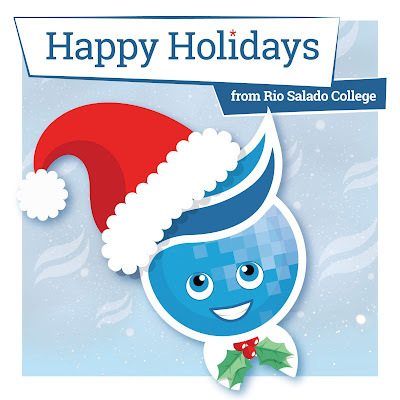 The Maricopa Community Colleges and most Rio Salado services will be closed Mon., Dec. 24, 2018 – Tue., Jan. 1, 2019 for the winter break. We will resume regular business hours Wed., Jan. 2. Math Emporium + Inspired Students = Success! 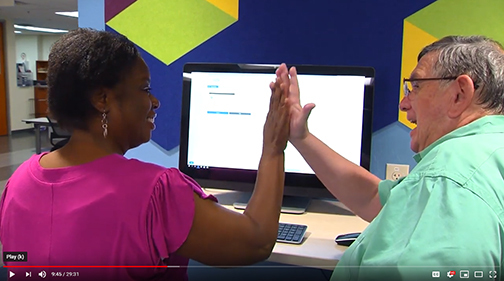 Learn about the new approach we’re taking with tutoring at our Math Emporium in Phoenix by watching this Maricopa Now feature by Maricopa Community Colleges Television reporter Dee Anne Kinkade. 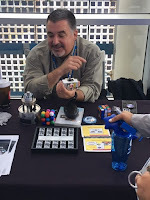 The Math Emporium is a free service available to all Maricopa Community Colleges students—offering customized learning solutions for you— at any stage of your educational journey. Learn more now about our Math Emporium. 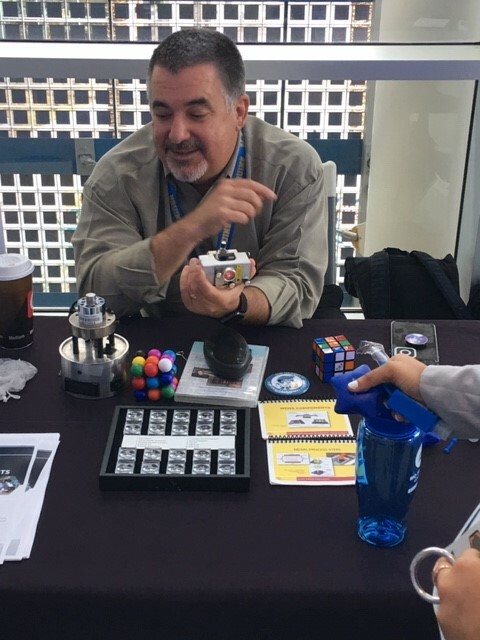 Pictured here are Rio Salado's Faculty Chair of Mathematics John Jensen working with Shawnda Howerton, a Rio Salado adult re-entry student who is getting re-acquainted with math and having some fun along the way. Today we take pause to pay tribute to the driving force behind our 40-year history-- students! We applaud your dedication and perseverance. It has been a great honor to be of service to you through the years. We hope this 40th anniversary commemorative video tribute to the #RioGrad Class of 2018 inspires you to continue your educational journey-- and to encourage others to join you! “As graduates you truly know what it means to succeed. You have experienced the effort that success requires…. Success is not a task, which anyone ever completes. Success is an attitude and it is a process. 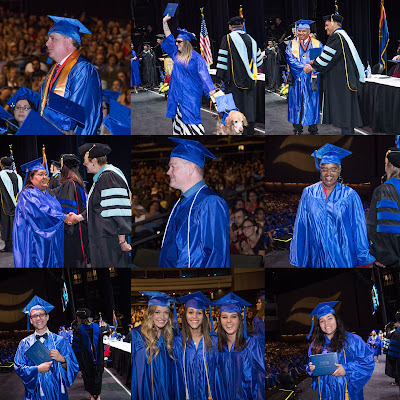 It is an indication that you have made a choice to make the most of yourself and to develop your potential to the fullest.” -- Maricopa Community Colleges Governing Board Vice President Linda Thor. Look for other 2018 #ThrowbackThursdaymemories later this month. 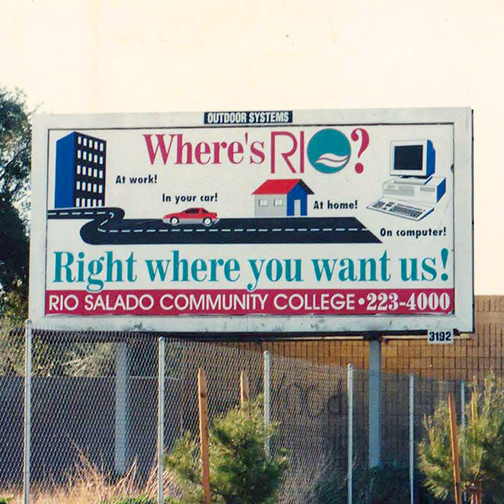 Share your photos, stories and memories via email to RSCmemories@riosalado.edu or social media using #RioSaladoCollege40th. #FinalsWeek Research? 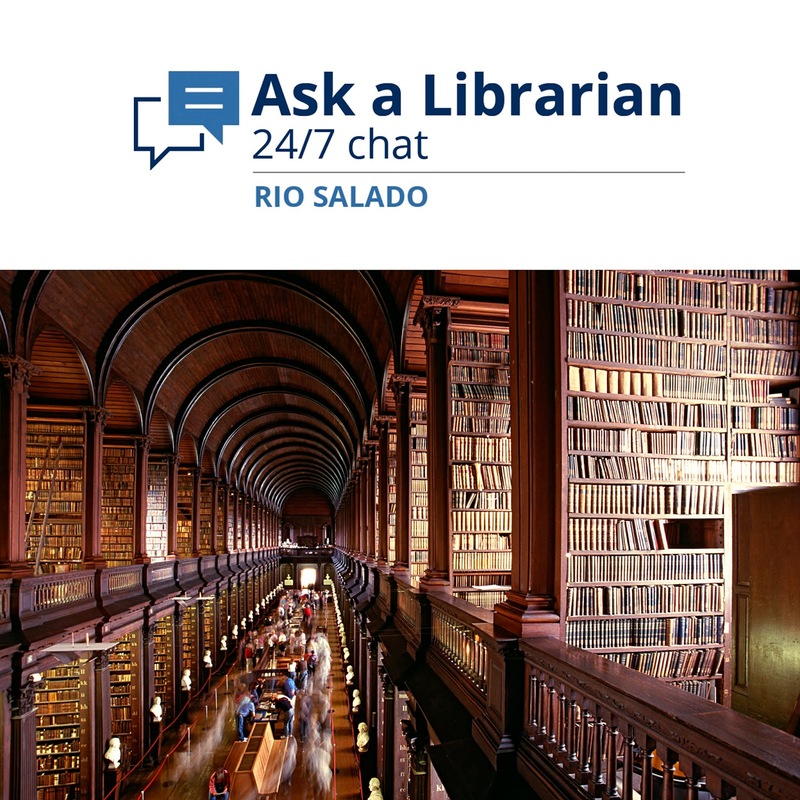 Ask a Librarian 24/7! Overwhelmed by a research project? Need a librarian NOW to help you with #FinalsWeek? Ask a Librarian was made for you! Ask a Librarian is designed to help you succeed! Getting through Finals Week, #YouGotThis! This is the time of year when many Rio Waves are preparing for finals-- and graduation. 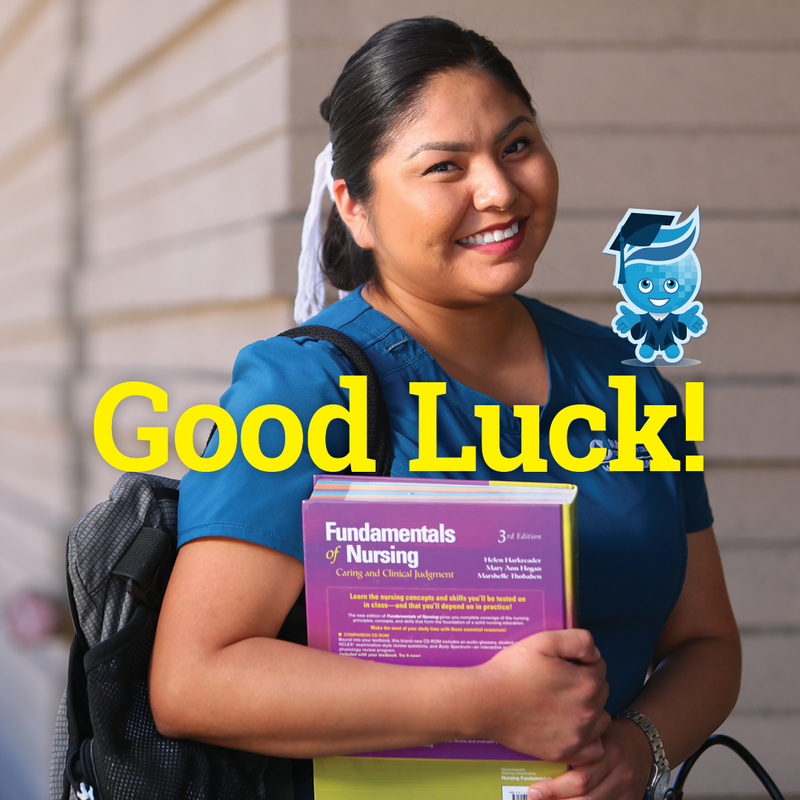 We wish you the very best as you wrap up the semester and this part of your educational journey. Here are 5 Ways to Stay Calm during Exams Week from the Maricopa Community Colleges. 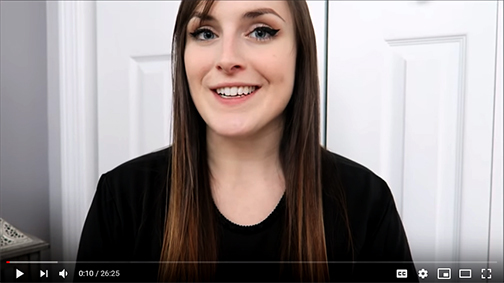 Check out our student success tips videos for additional advice. Graduating? Celebrate your accomplishments with us during our May 2018 commencement ceremony. Details coming soon at www.riosalado.edu/about/teaching-learning/student-life/graduation/Pages/default.aspx. Holly Harper was poolside at her new apartment building not long after moving from Oklahoma to California when the payphone rang. It was 1989. Harper and her husband were so new to town that they didn’t have a phone in their apartment yet. So, she searched the newspaper classified ads for a job as a dental hygienist and made calls from the payphone by the pool. For Harper, the call came quickly. Within two weeks of packing up a U-Haul and making the cross-country move, she landed a job. “I do remember getting the call. 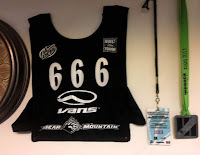 It was three days a week. A really great job.” Fast forward almost 20 years and while the technology has changed, the demand for dental hygienists has not. It’s still extremely high. 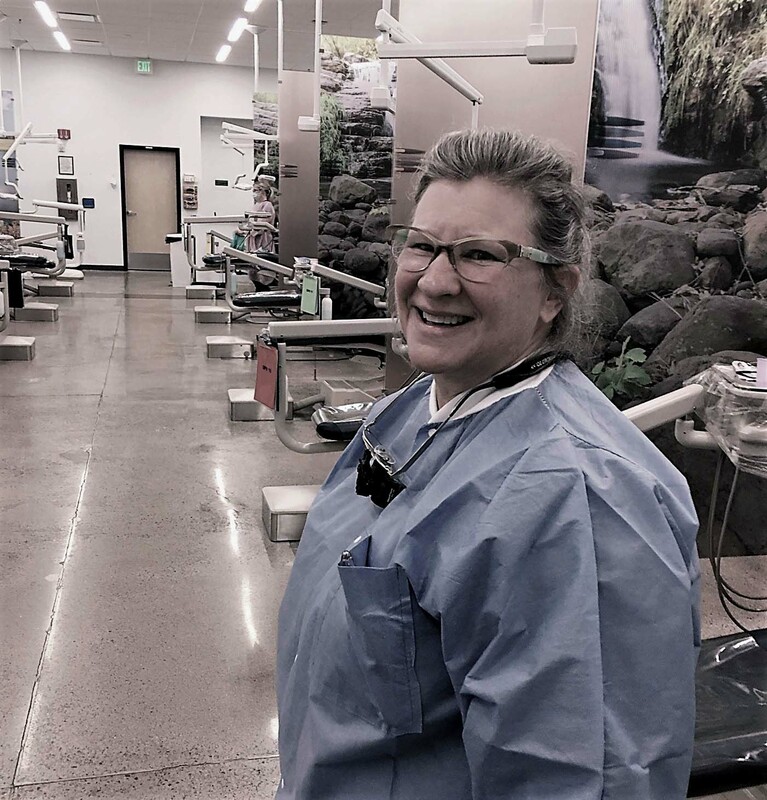 “Hygienists are very employable,” says Harper who now runs the dental hygienist program at Rio Salado College, which will mark its 20th anniversary next year. The school offers an accelerated 16-month, $25,000 program allowing students to enter the workplace upon graduation. And entering the workplace they are. According to the U.S. Bureau of Labor Statistics, the field is growing at a rate 20 percent higher than the national average for related jobs. Among the biggest reasons for the popularity of dental hygiene is the pay. The bureau says that the average salary for a dental hygienist working 40 hours per week is about $74,000 annually, or just over $36 an hour. Another big draw is the ability to create a flexible work schedule. “According to our last survey, our graduates are working as much as they want to,” Harper says. The demand is so high, she says, that hygienists can in large part determine their own schedules. Some want to work full time, others opt for a few days a week. 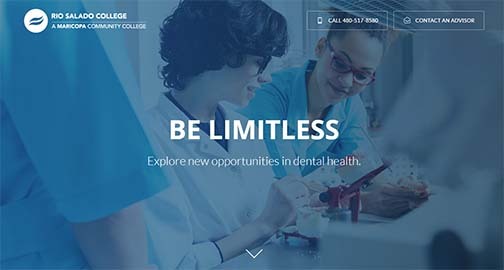 Dental hygiene programs are popular both for young people with a few semesters of college basics under their belt, or people making a career change. Garner is a different breed indeed. 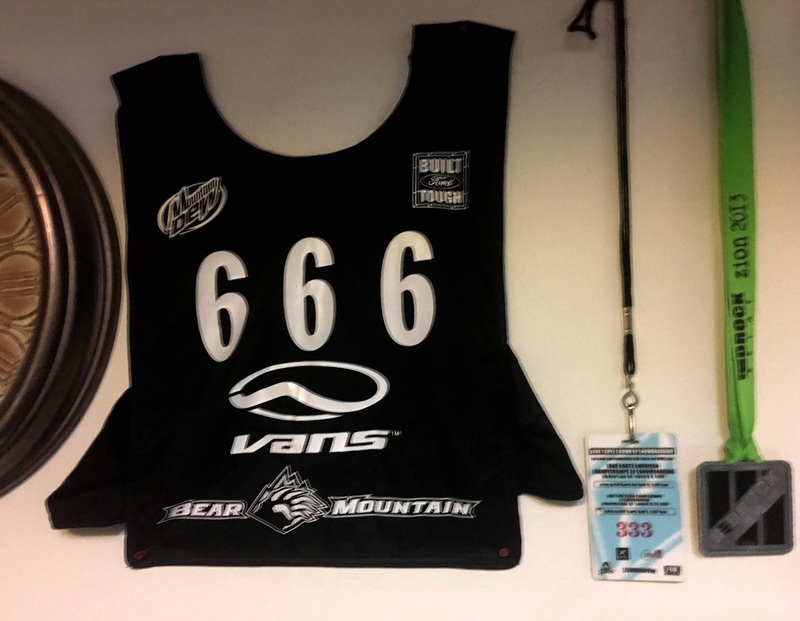 She competed in the 2003 North American Championships of snowboarding, satisfying her adventurous side, she says. She worked in corporate banking until it became too stressful. Most recently, she has been designing trophy belt buckles for rodeo champions but wanted a backup plan. And along came dental hygiene. “Flexibility is super important to me. If I only want to work three days a week, I can work three days a week and support myself." Garner estimates she spends about 70 hours a week on the program by the time she figures in classes, homework and commuting time. “Your family has to be fully prepared,” she said. 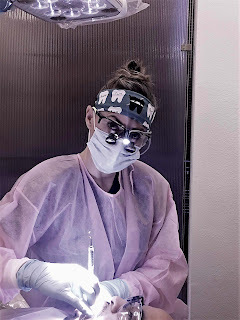 U.S News & World Report ranks dental hygienist as the number one healthcare support job, above other popular choices such as Medical Assistant, Medical Secretary, and Massage Therapist. The publication bases its rankings on a variety of factors, including salary, employment rate, stress level, and work-life balance. It is important to note that while the pay is relatively good for dental hygienists, upward mobility is considered low. There isn’t a lot of headroom for most hygienists beyond making slightly more money in a different dental office. 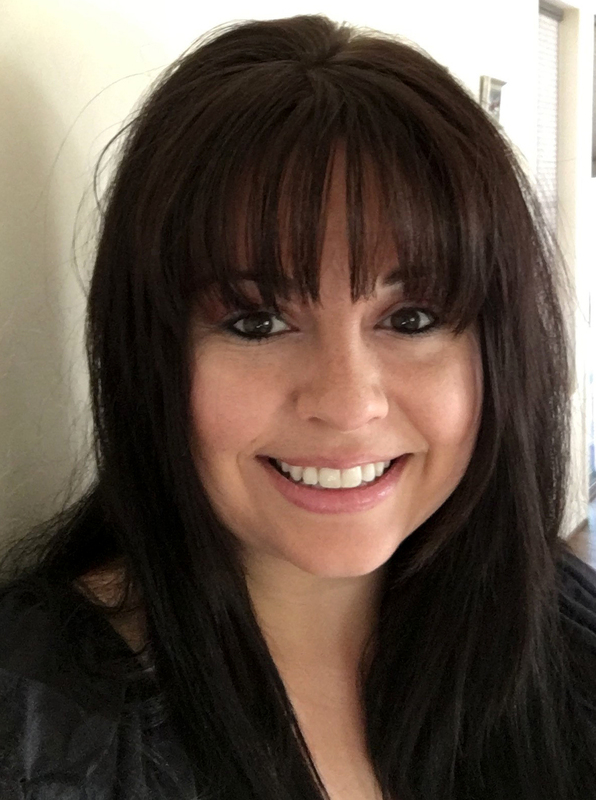 But for 44-year old Jessica Money, a single mother of six, the promise of a good salary in a quick turnaround time and a high degree of flexibility is worth the investment … and the intensity of a 16-month training course. “You definitely marry the program,” says Money whose choice to attend hygienist school wasn’t so much a midlife job change, but a necessity. In the near future, Money says she would like to be able to save enough to buy her own house and become financially independent. She chose the 16-month program to get her coursework done quickly and get into the workforce. Harper, the Rio Salado program manager, says that’s the typical person she sees in her program. “We do have quite a few single moms, also some who have their bachelor’s for whom this is a second career and they want to get in here and get it done,” she said. This particular program has graduated about 400 students in its nearly two decades, many of whom work in dentist offices in the Phoenix metro area. And according to the Bureau of Labor Statistics, the demand is not going to drop any time soon. Former snowboarder Kathy Garner is counting on that to be the case. “Anybody can do this if they put in the time and effort,” Garner said. Happy Holidays, Rio Waves! The Maricopa Community Colleges and most Rio Salado services will be closed Mon., Dec. 24, 2018 – Tue., Jan. 1, 2019 for the winter break. We will resume regular business hours Wed., Jan. 2. We hope you enjoy a happy and safe holiday season-- and a prosperous New Year! 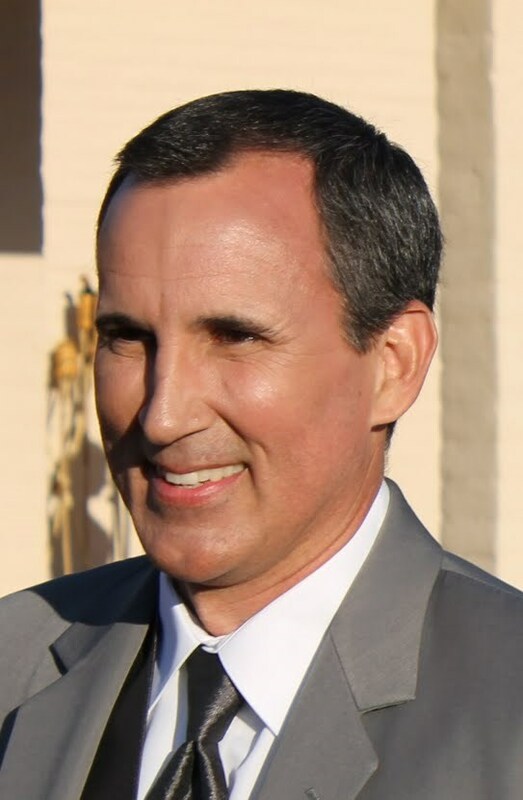 Our new Vice President of Student Affairs Greg Pereira will receive his doctorate from Arizona State University's Mary Lou Fulton Teachers College in leadership and innovation this December. 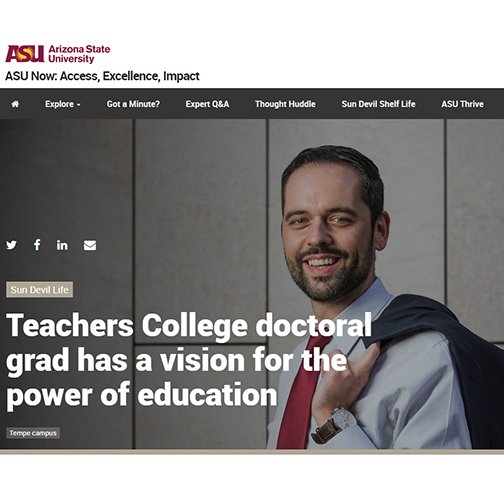 Learn about his educational journey-- and vision for the power of education to improve the lives of others in this ASU Now interview. 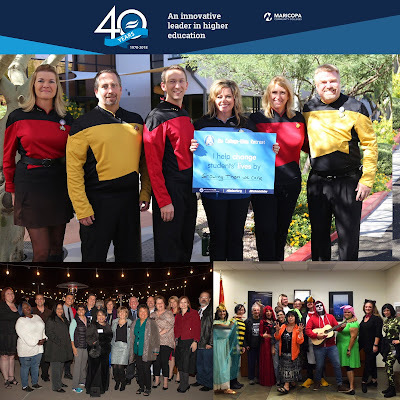 Our 40th anniversary look back at Rio Salado College’s history is coming to an end—and we’re heading back to the future! Today, we begin revisiting 2018. At the beginning of 2018 we launched our year-long 40th anniversary celebration and hosted a series of events including a gathering to form a giant human 40. Enjoy this behind-the-scenes video. We also worked to fulfill 40 acts of service. Check out these related stories to learn about our volunteer efforts. 2018 was a record-breaking year for Rio Salado dual enrollment graduates! 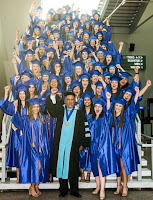 Of the 200 students who took part in the 2018 commencement ceremony on May 9 at Comerica Theatre, were 92 dual enrollment students (See related story). More than 50 of the dual enrollment participants were from Xavier College Prep-- the first high school Rio Salado partnered with in 1987 to launch its dual enrollment program, which helps nearly 7,000 Maricopa County students at 43 schools earn college and high school credits at the same time. 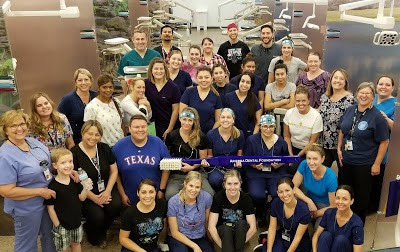 In June, the college’s dental hygiene students, alumni and staff members partnered with the Arizona Dental Foundation and community volunteers to host a free clinic for kids. 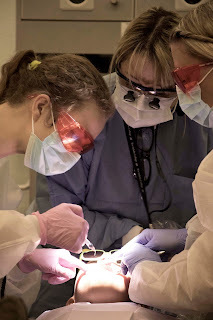 A total of 690 dental procedures were provided to 124 children, totaling $42,724.64 of care in one day! Look for other 2018 memories later this month. 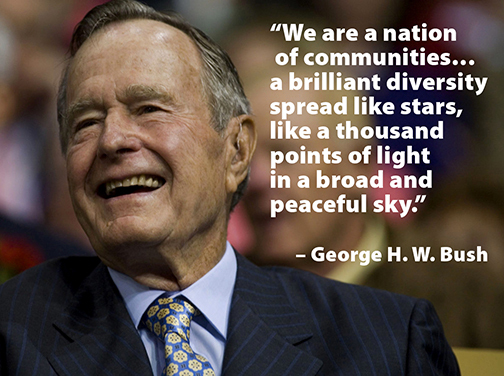 We take pause to join you and the nation in saying goodbye to our 41st President George H. W. Bush-- and honoring his service to this country. Reminder! 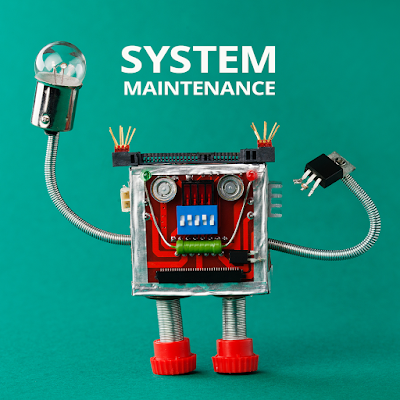 The Maricopa Community Colleges Student Information System (SIS) will not be available this weekend for scheduled maintenance. Fri., Dec. 7, 6 a.m. – Mon., Dec 10, 6 a.m. This means you will not be able to register or pay for classes, request official or unofficial transcripts, check grades and financial aid status or access to-do list items and message center notices. Please plan accordingly. Faculty and staff will not have the ability to complete assignments or enter grades. Maricopa email and Canvas/RioLearn portals will not be impacted by these changes and will remain available to students and faculty. 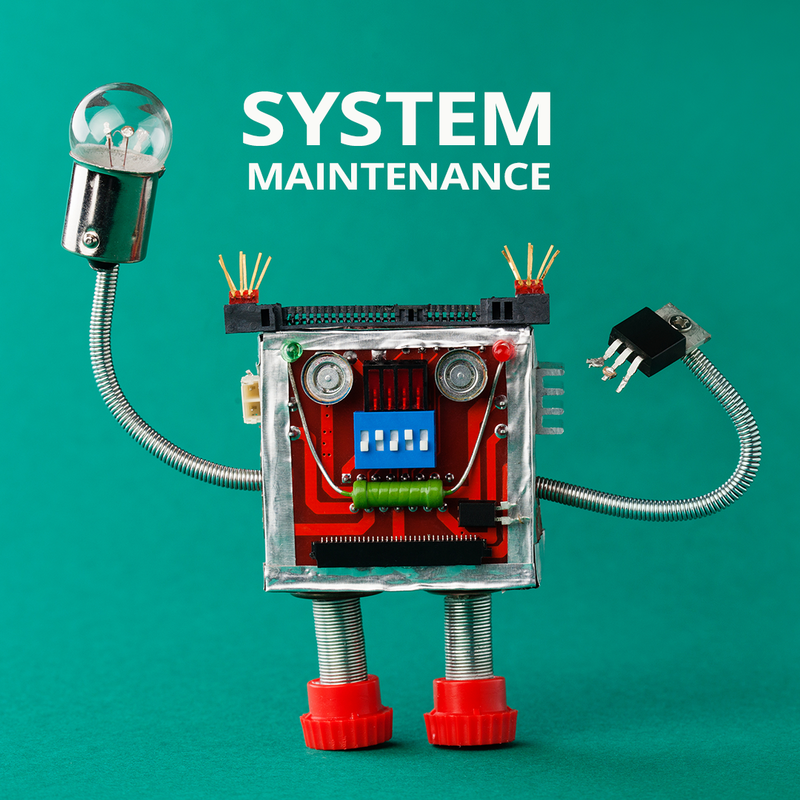 We appreciate your patience as we update our systems to improve our service to you. We are proud to announce that Rio Salado College’s Addictions and Substance Use Disorders program was granted full re-accreditation by the National Addiction Studies Accreditation Commission (NASAC) through 2027. NASAC is an academic accreditation organization for higher education addiction studies programs. Accreditation is awarded to institutions that meet and maintain a set of credentials. 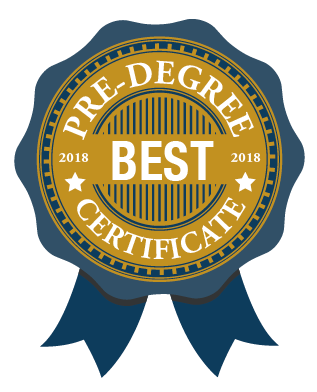 NASAC accreditation is specialized and not institutional— and designed to help addiction and counselor faculty members prepare for institutional, regional accreditation like the Higher Learning Commission accreditation process, which reviews an entire university or college. 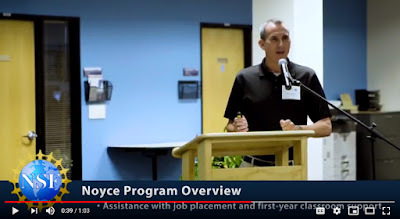 “We work diligently to develop coursework that is relevant and up-to-date, to meet the needs of students who are entering into the field— as well as career professionals who are seeking continuing education opportunities,” said Kirk Bowden, who serves as Rio Salado's Faculty Chair for this program. Dr. Bowden is a national leader in the Addiction and Substance Use Disorders field, who works with a team of faculty members who are also experts in the field, to create engaging educational content to help professionals stay informed and connected. Rio Salado serves as one of Arizona’s top educators of addictions counseling professionals, offering online classes, certificates and an associate degree in Addictions and Substance Use Disorders. Rio Salado also offers a series of non-credit, online seminars to help addictions and counseling professionals stay informed about the latest industry developments and strategies, and to meet continuing education requirements. Look for spring offerings soon. 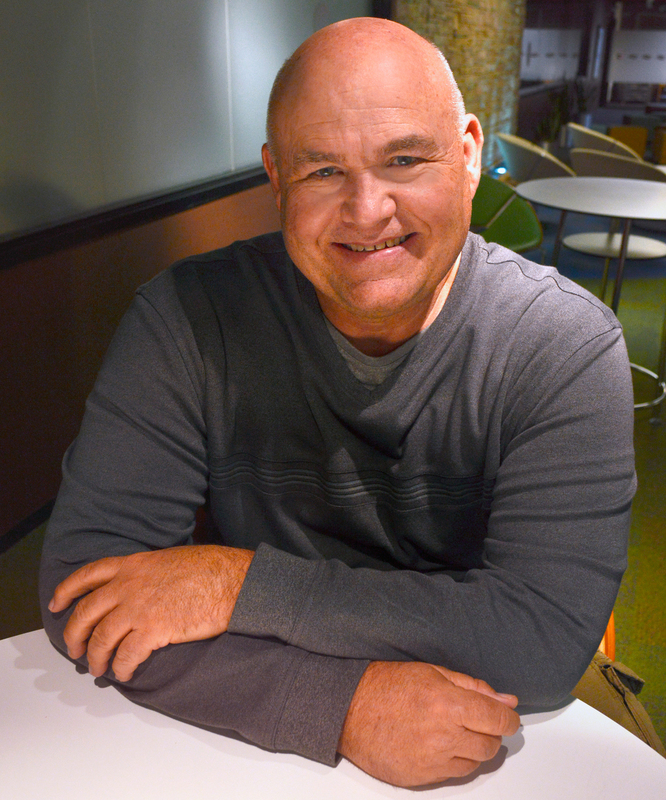 “Many of our students are parents, teachers and social workers, who, through their daily lives and jobs, encounter people with addiction issues,” Bowden said. “They complete our seminars and courses for a variety of reasons. As such, we are committed to providing quality instruction that will educate and empower professionals and students alike,” said Bowden.